This starter culture is so easy to use, even your children can be involved in making Fromage Blanc. 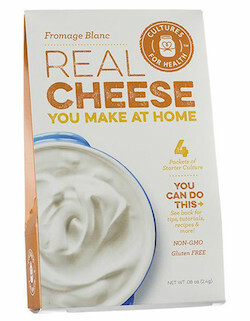 Fromage Blanc has a rich, mild taste - more mild than yogurt. It makes an excellent spread for crackers or bread or a dip for fruits and vegetables. Ingredients: Lactose, Ascorbic Acid, Lactic Bacteria (Lactococcus lactis supsp. Lactis, Lactococcus lactis subsp. cremoris, Lactococcus lactis subsp. diacetylactis, Leuconostoc mesenteroides subsp. cremoris), organic vegetable rennet. Each packet contains both starter culture and rennet. Use 1 packet of starter with 1-4 quarts of fresh milk. Cultures at room temperature at 72-77ºF.